Bloubergstrand, a village-like seaside suburb 15 kilometres from Cape Town CBD has the perfect beach which is ideal for walks, surfing, kite-surfing, windsurfing and swimming (it is obviously for bold swimmers, the water is icy cold thanks to the nutrition rich Benguela current). It is here where you have that picture perfect view of iconic Table Mountain, Devil’s Peak and Lion’s Head and Cape Town as well as Robben Island. A salty scent lies in the air, and you get a great maritime aerosol fix that is good for your breathing system and the skin, on a walk from Milnerton Lightouse all the way to Big Bay. The area is the home of creative entrepreneur Verena Stefanie Papsch who started to design and sell kitchen, home and lifestyle textiles in 2012. Her creativity paired with her expertise in Sales and Marketing make dishy designs a success story. Verena lives together with her partner and two furry friends and I’m so lucky she found the time to tell us a bit about Bloubergstrand. The Touristin: Three words that characterize Bloubergstrand? Verena Stefanie Papsch: Authentic, laid-back and windy. The Touristin: How do you get around Bloubergstrand? Verena Stefanie Papsch: It’s a relatively small area and lies along a beautiful promenade so walking is ideal. On a windy day (which is quite often in summer), I prefer to drive though. The Touristin: What is the best kept secret about Bloubergstrand? Verena Stefanie Papsch: As the area is a bit out of town, the promenade pathways are not as busy as in the better known areas in Cape Town. I love walking the beachfront path, which runs along Stadler Road as it’s remained relatively unspoiled over the years and the view over the bay of Table Mountain is breath-taking and changes every day. In winter, the sea gets very choppy and clouds and wind make for very dramatic façade. In summer, on a calm day, you get the perfect post card picture of this wonder of nature. If you’re very lucky, you might even spot some whales. The Touristin: The best place for a hot chocolate or coffee in Bloubergstrand? Verena Stefanie Papsch: Carlucci’s on the beachfront in Blouberg. The Touristin: What is one restaurant we must try out while in Bloubergstrand? Verena Stefanie Papsch: For burger lovers, I would recommend Jerry’s in Blouberg. For affordable and good quality seafood, it would be the Ocean Basket on Beach Boulevard in Table View. For a foreign tourist who would like to experience well-priced and delicious seafood and a great, non-pretentious location, I would recommend Café Orca on Beach Road in Melkbosstrand every time. 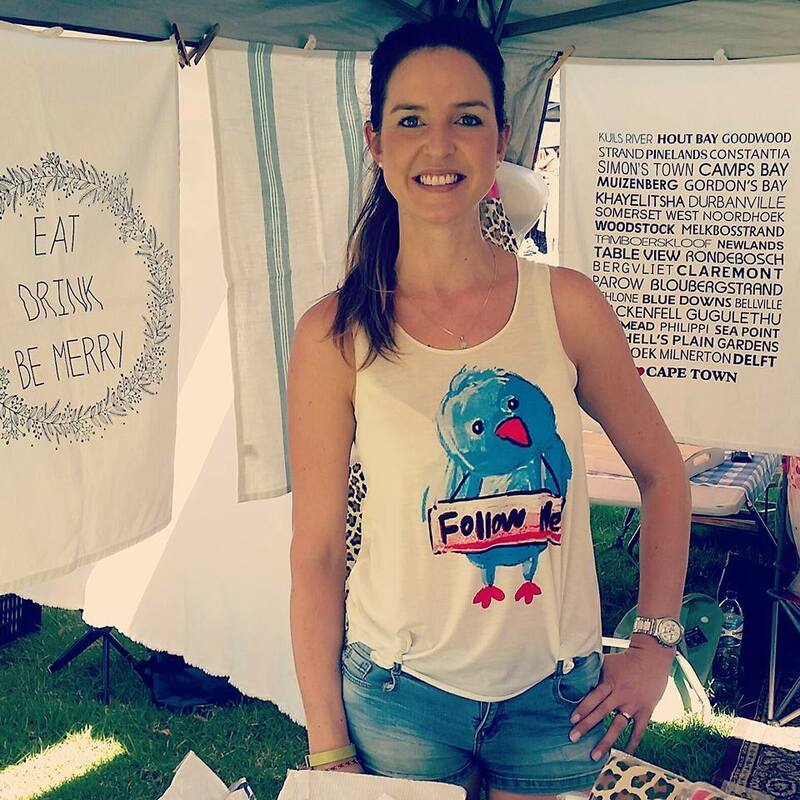 Verena Stefanie Papsch: If I’m not working at a market selling dishy designs, you could find me walking the beach or promenade, eating frozen yoghurt on the beach from FrozenYo on Blouberg Beachfront or eating a burger at Jerry’s with my fiancé Patrick. The Touristin: What souvenir shall we bring back from Bloubergstrand? Verena Stefanie Papsch: A photo taken by you of the beautiful Table Mountain …much better than a photo shopped postcard. The Touristin: Thank you so much Verena. I’m delighted I found you and your designs on the Slow Market in Stellenbosch. I wish you all the very best for everything and I hope we will see more dishy designs in the future. Visit Verena and dishy designs on twitter @dishydesignssa. To read where I found Verena and where to find more creative spirits in South Africa read Creative South Africa. Beautiful things you would want to buy on vacation in Cape Town.